over the weekend our families got together to celebrate my birthday. of course there was birthday cake involved. this year i was in the mood for a chocolate hazelnut combination, so ryan and i got to work creating the ultimate chocolate hazelnut cake. if you are a fan of chocolate and hazelnut, look no further. 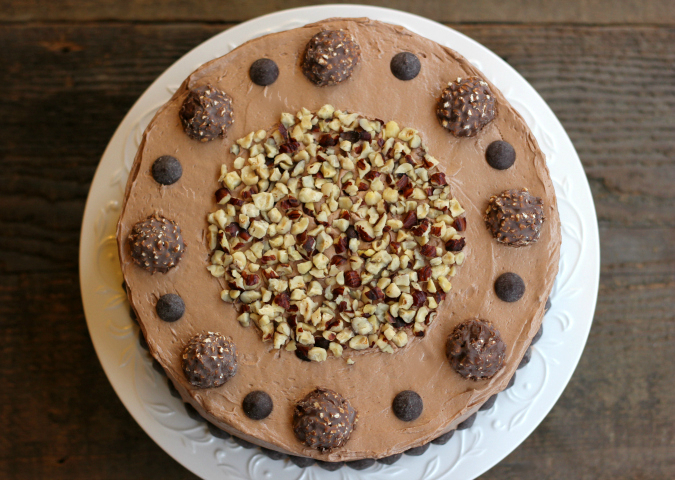 i'm calling this "the ultimate" chocolate hazelnut cake recipe because if nutella and ferrero rocher got together and had a baby that was a cake, it would be this cake. here's the break down . . . two layers of chocolate cake with a layer of nutella fudge in between, all covered with whipped nutella buttercream frosting, and decorated with chopped hazelnuts, chocolate chips, and ferrero rocher candy. 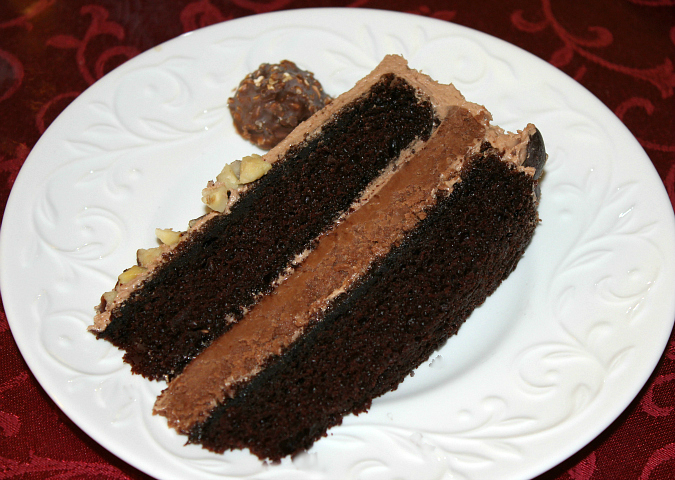 the chocolate cake has a wonderfully deep flavor thanks to the addition of coffee in the cake batter. the cake itself isn't sweet which is great to balance out the nutella fudge layer which is a bit on the sweeter side. the frosting is part buttercream, part whipped cream, which means it is light and fluffy. 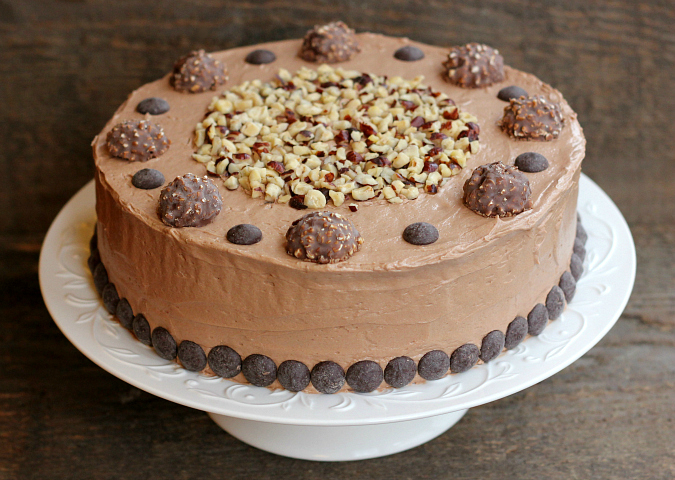 the nutella beaten into the frosting really punches that chocolate hazelnut flavor all the way. to make the cake: preheat your oven to 350 degrees F. grease and flour the sides of two 9-inch round cake pans and line the bottom of the pans with parchment paper. in the bowl of an electric stand mixer fitted with a paddle attachment, sift the flour, cocoa powder, baking powder, and baking soda together. add the sugar, buttermilk, oil, eggs, and vanilla. beat together until combined. stir the espresso powder into the coffee. with the mixer on low, slowly stream in the coffee. evenly divide the batter between the prepared pans. bake for 30-35 minutes, until a toothpick inserted into the cake comes out clean. once baked, allow the cakes to cool in the pans for 10 minutes before removing the cakes from the pans and allowing them to cool completely on a wire cooling rack. to make the nutella fudge layer: line one 9-inch round cake pan with plastic wrap. in the bowl of an electric stand mixer fitted with a paddle attachment, mix together the powdered sugar, nutella, and melted butter. the mixture will be crumbly. add 3-4 tablespoons of cream gradually, 1 tablespoon at a time, until the mixture becomes a workable dough. turn the mixture out onto a solid surface and kneed together into a dough. (it should not be too sticky or too crumbly.) press the dough evenly into the plastic-lined cake pan. cover with plastic wrap and chill in the refrigerator for 30 minutes. to make the frosting: in an electric stand mixer fitted with a whisk attachment, combine the butter, nutella, and vanilla. beat to combine. gradually add the powdered sugar, alternating with the cream to achieve desired consistency and thickness. to assemble the cake: place one layer of the chocolate cake on a cake stand. spread a thin layer of frosting on the cake. remove the fudge layer from the plastic wrap and place on top of the frosted first layer of cake. spread a thin layer of frosting on top of the fudge layer, then place the second layer of cake on top. evenly cover the entire cake with the remaining frosting. decorate with chopped hazelnuts, chocolate chips, and/or ferrero rocher candy. The cake was very good and I liked the crunch that the nuts gave it.